IT IS VERY IMPORTANT TO CONSULT THE SCHEDULE. MONDAY, the site will be open from noon to 10 pm. Due to the great number of RVs on the site, the Fire Department FORBIDS camp fires. Only propane fires for cooking are allowed. TUESDAY, the site will be open from 9 am to 11 pm. Open practices will happen from 9 am to 3 pm with separated groups. WEDNESDAY, the site will be open from 6 am to 11 pm. ECAN Competition. THURSDAY, the site will be open from 6 am to 11 pm. ECAN Competition. FRIDAY, the site will be open from 6 am to 11 pm. ECAN Competition. SATURDAY, the site will be open from 6 am to 11 pm. ROCKSTAR ENERGY NATIONALS and women’s pro Competitions. SUNDAY, the site will be open from 6 am to 11 pm. CHALLENGE QUÉBEC / MRC Provincial Competition. REGISTRATION FOR VETERAN PILOTS WILL BE ON THURSDAY EVENING FROM 5PM TO 6:15PM, AND FRIDAY MORNING FROM 6H30AM TO 7H30 AM. Rider’s registrations are on Tuesday evening, from 5 pm to 9 pm, and Wednesday morning from 6:30 to 8:15. VETERAN’S REGISTRATIONS ARE ON WEDNESDAY EVENING FROM 5 PM TO 6:15 PM AND ON THURSDAY MORNING FROM 6:30 TO 7:30. Opening ceremonies will be Tuesday evening from 8 pm. Prizes for Yamaha contest, contingencies and trophy with the moto industry people. Registration for the straight rhythm competition will also be that night. MANDATORY PILOTES MEETING will stand Thursday morning at 8:15 am, just behind the starting grid. On Friday night from 7 pm to 9 pm, the straight rhythm competition will take place. Trophies and awards will stand on Saturday night from 7pm. The evening will close with the awarding of the trophy “Courage Fred Laflamme”. 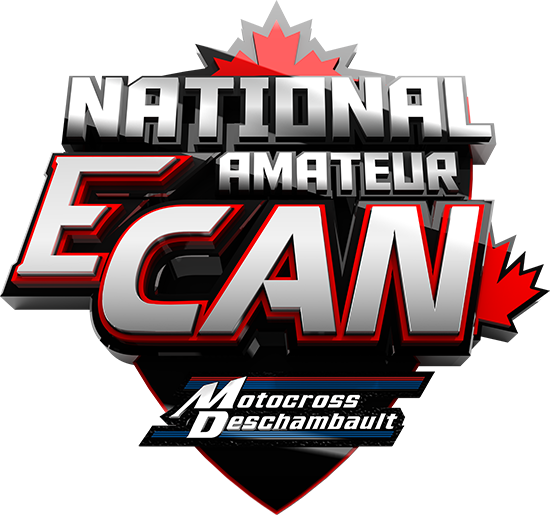 Note that all pro riders who won’t be in the top 20 in MX1 or in the top 10 in MX2 from the national ranking, will be allowed to participate to the Grand National Amateur Motovan. The best amateur pilots from Canada will be present during these 4 days of competition. This event is getting more and more prestigious with the arrival of many pilots from the Maritimes and from the Ontario. All people from the motocross industry will also be present with as a main objective of encouraging pilots and eventually to discover the futur JSR and Marco Dubé. The best professional pilots in women in Canada will face each other on Saturday. The best Canadian professional pilots in women will compete on Saturday. The registration fee is 60$ for the main track and 40$ for the pee-wee’s track. Use of a YZ from the winner’s choice for the 2020 race season. The Yamaha rider with the most cumulative points, in the top 3 classes, will be selected as the winner. In the event of a tie, the rider with the greatest number of WINS will be selected as a winner. If always attached, the rider who has reached the points during the race of less course will be selected as winner.